Raymond Charles Robinson, 'the only genius in the business', recorded prolifically for many years until his death in 2004. Although he had his greatest success with R&B sides like 'What'd I Say' and 'I Got A Woman, he was an accomplished pianist in styles as diverse as jazz and country music. He recorded plenty of jazz sessions for Atlantic, including some memorable work with Milt Jackson. This 1961 set sees him playing jazz, swing and R&B influenced music, but always with the blues. As the name would suggest, this album has a laid back, end of the night feel. As music to contemplate life's troubles to at 3am it's damn near perfect. 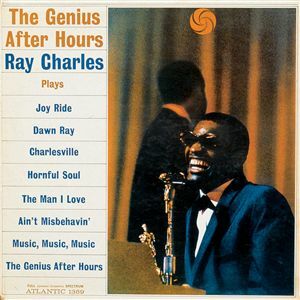 Although the tracks vary in tempo, the after hours feel persists throughout the whole album, even in a piece as frenetic as the bop-based 'Joy Ride', which also features superb alto playing from Newman and a fine muted solo from Hunt. My favourite, though, is the title track, evocative of smoky, half-deserted clubs sometime past closing; it's slow shuffle being the perfect foil for a performance full of emotion by Charles. Given that it feels like 3am inside my head right now, this is possibly the finest thing I could wish to hear.